Last three hours for Uncommon Threads! Better hurry. If you haven’t seen this spectacular show you only have until 6:00 tonight. I’m very sad to see this one go. Thank you to all of the talented artists whose thoughtful, moving, substantial—and not to mention well-crafted—works filled our souls for the last six weeks. We placed 42 books in library and private collections from this show. A record that we just as well might as well call a sell out. Congratulations to everyone involved. Just in case you can’t make it you can find the online catalog here. Finally! Results from our librarian friends who voted for the Librarian’s Choice Award for Uncommon Threads. We mailed catalogs to 30 special collections libraries at museums and universities across the country and asked hundreds more to vote online for their three favorite books in the show. These committed librarians with a passion for artist books spent a lot of time combing through this amazing show to find the treasures and enthusiastically responded with a huge number of votes. Thank you to all of the uncommonly good artists who took part in Uncommon Threads for making this such a successful show. It is hard to believe that there is only one more week before the show comes down. We’ve had a terrific number of enthusiastic visitors to the gallery plus lots and lots of sales for our deserving artists. Congratulations Best of Show Artists! 23 Sandy Gallery is pleased to honor three artists with a Best of Show Award for Uncommon Threads: The Handicrafts in Book Arts. These three works are exemplary in content, concept, techniques, materials—and all have impeccable workmanship. This book is a beautiful knitted work that hangs from the ceiling and drops into a custom made fabric bag. 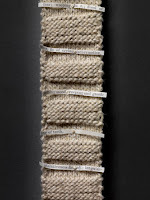 From Tekla’s artist statement, “There is comfort in the repetitive motion of knitting. It quietly consumes time and offers great satisfaction when the end of a skein is reached. There is no such neat end to mourning. Like the stream of words in a thesaurus—the endless linking of one word to the next—recovery from loss is an endless practice with no hope of mastery.” But, out of grief has come a lovely work. We were very excited last Friday when Tekla walked into the gallery and introduced herself. Turns out she flew in from Massachusetts just that day to join our First Friday celebration. And, it was her birthday to boot! Learn more about Tekla’s work here. Here at 23 Sandy we have been honored to have Elsi’s work in every single juried show that we have held since opening our doors in 2007. As usual, Elsi’s two works in Uncommon Threads are gorgeous, thought provoking and beautifully made. This book is “a fictional story about a struggling farmer’s wife’s life as expressed through the domestic arts of sewing, quilting and crocheting… this story had to be told in two separate volumes rather than one, that they should sit side by side, and it reflected the challenges of women of her generation.” Learn more about Notions & Fabrications | Remnants here. P.S. Watch for Elsi’s solo show here in the gallery in February of 2012. 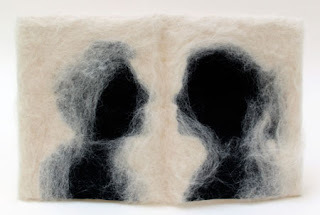 Felting is a fascinating technique that I’ve never seen done quite so beautifully as in this book by California artist Nanette Wylde. She tells us “Interpersonal communication is a woolly fog of intentions and perceptions, interpretation and memory.” This is one book that you really should see in person. Felting must be a difficult medium to capture well in photographs because this book is so much more stunning than it looks on your little computer screen. Check it out here if you can’t make it to the gallery. Congratulations to all three of these very talented artists! Come join us tomorrow, night, First Friday for a special event benefiting the IPRC, a non-profit that teaches zines, book arts, letterpress printing and more to Portland teens and young adults. IPRC representatives will be in the gallery demonstrating letterpress printing and you might even get to try the press yourself. Buy at “i•art” button for $1 and the entire proceeds get donated directly to IPRC to support their terrific programs. Learn more about IPRC here. And don’t forget, this is also the First Friday artists reception for Uncommon Threads, our international juried exhibition exploring the handicrafts in book arts. We have several artists who either live in Portland or will be visiting for the events. Preview an online catalog for this incredible show here. So, you’ve all heard me gush about Sarah Bodman and her work at the University of the West of England Center for Fine Print Research before. Sarah puts out an amazing array of research, publications, books, journals and more, all focused on advancing our field of book arts. Her job as a research fellow at the university is unmatched here in the United States and I for one am grateful for her hard work. This year’s Artist Book Year Book looks fantastic. 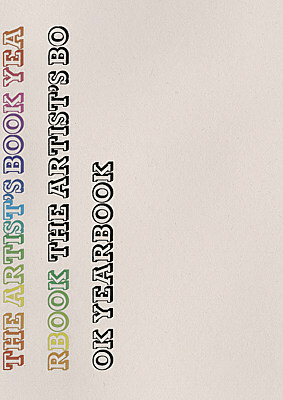 Another compendium of who’s who and what’s what in the book arts—around the world. You can pick up your copy here at 23 Sandy. I have only 10 copies on hand, so get here quick. Cost is $25. Over 600 artist’s book listings from 207 national and international artists. Reference listings of: collections, libraries, archives, bookshops, galleries, centres, design print & bind, publishers, dealers, presses, studios, competitions, fairs, festivals and exhibitions, journals, reference books, organisations, societies, websites, academic projects, touring programmes and courses. John Bently on books and community; Earle D. Swope’s extraordinary account of how he came to be a book artist; an update on the work of the collaborative artists’ group AMBruno; a study by Eileen O’Keefe of Sarah Jacobs’ thoroughly absorbing – Drawn from the Inventory: the Notebooks of Elisabeth Faulhaber; Jackie Batey celebrates the 10th issue of Future Fantasteek! ; Lawrence Upton has written on his extensive art collaboration with Guy Begbie; Davy & Kristin McGuire explain their beautiful performance piece The Icebook; Nicola Dale looks at the artistic potential of book destruction, and Radoslaw Nowakowski asks: Is a hypertext (artist’s) book possible? Linda Newington explores the book works of SALT + SHAW; Paulo Silveira reflects on the start of his recent academic project: The University and the Artist’s Book, and Reinhard Grüner shows us some of the very special presentation copies of artists’ books in his collection. Amir Brito Cadôr, Eric Doeringer, Lara Durback, the Idaho Book Artist’s Guild, Susan Johanknecht, Paul Laidler, SALT + SHAW, Clare Thornton and Maria White. Cover design by Tom Sowden. Learn more about this an other UWE publications here.